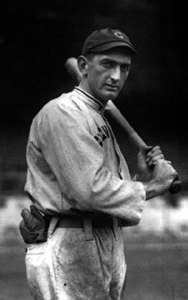 On this date one hundred years ago, the Philadelphia Athletics sent Joe Jackson (“Shoeless Joe”) to Cleveland. Jackson was signed by Connie Mack in 1908. He played a handful of games in both 1908 and 1909, decided he hated Philadelphia, the big cities, and the travel, so he returned to South Carolina and did not report in 1910. By the end of July, Mack gave up on him and sent his contract to Cleveland. Jackson reported to Cleveland, got into 20 games and hit .387 with a home run, four stolen bases, and 29 hits. This time he stayed around and became a star. In fairness to Jackson, he was only 18 in 1908. I’ve made a point of staying away from posts dealing specifically with Jackson for a reason. He is one of the most polarizing figures in baseball history. Only Pete Rose and Barry Bonds rival him as a controversial player. I feel my job here is to inform, not confront. You want confrontation, go visit a political blog. Lots to “confront” about. Having said that, it’s time to deal with Shoeless Joe. 1. He was underpaid. So what? I’m underpaid. My wife is underpaid. My first-born (who I was willing to give up a paragraph or two ago) is underpaid. Most of you reading this are underpaid. Does that make it OK to, in Jackson’s case, throw the World Series? Surely not. 2. He was too stupid to know what he was doing. Oh, really? What did he think they were giving him the bribe money for, his looks? Besides unlettered and stupid are two different things. There’s ample evidence that Jackson was illiterate, but also evidence he wasn’t stupid. He had a meal routine that belies stupidity. He always ate with a teammate. If the waitress came to him first he’d tell her he hadn’t decided yet and to get everybody else’s order and come back. He’d then listen to what they ordered and get one of the same things. If he wasn’t first, his response was “I’ll have what he’s having.” That’s not a stupid man there. In fact that’s rather clever. 3. Comiskey was a jerk. Got me there; Comiskey was a jerk. But Comiskey isn’t the one throwing games. Comiskey’s human qualities are not in question here, Jackson’s are. And to my mind, Jackson is as big a jerk as Comiskey and two wrongs don’t make either man right, or less of a jerk. 4. Jackson played OK in the series. That’s sort of right. But if you break down his series by at bats you see he doesn’t come through in crucial situations. His home run, as a simple example, is after the final game is already lost. He drives in six runs, but all in games the Sox win or in meaningless situations (like the home run). I’ll give you that Gandil and Cicotte and Williams are greater villains in losing games, but that doesn’t make Jackson any kind of hero. So there, I’ve said my piece. Obviously I don’t like Jackson and have no wish to see him in Cooperstown. I accept that some other people do. It’s a free country. They’re entitled to be wrong. Normally this post would be my last for the month, but I have a particular post I want to run on the 30th, so I’m doing the end of July 1910 post a little early. It shouldn’t surprise anyone that he 1910 season was playing out as most seasons do. By the end of July half the teams were already playing out the string, while most of the rest were trying hard to maintain contact with the leaders. In each league, only a couple of teams were in position to actually take the pennant. In the National League the Cubs were seven games up on the Giants and 7.5 ahead of Pittsburgh. The Cubs had gone 21-9 for the month, while the Giants were going 15-14 and the Pirates 19-10. Everyone else was falling back. The fourth place Reds were playing .500 ball (45-45) while Philadelphia, St. Louis, Brooklyn, and Boston filled out the second division. Last place Boston was 27.5 games out of first. In the American League, the Athletics were in first place by six games over Boston and seven over New York. For July Philadelphia went 22-9. Defending champion Detroit was 9.5 games out in fourth place and the last team with a winning record. Cleveland, despite a great year from Nap LaJoie, had a losing record in fifth place followed by Washington, Chicago, and the hapless Browns who were in last place 33 games back. The big story of the year continued to be in New York where the Highlanders (Yankees) are still in contention, although they had a bad July (17-16). Coming off a bad 1909, they were showing signs of making a run for first. Of course the continuing conflict between manager George Stallings and first baseman Hal Chase was not helping team morale (Stallings alleged that Chase wasn’t always playing to win. Stallings was right.). The other day, prefatory to doing my post on Cy Young, I looked over the list of 300 game winners. Most of the modern ones are fairly well-known, as are most of the ones who pitched in the early part of the 20th Century. That’s not as true of the 19th Century pitchers. Most have fallen into obscurity. The recent book on 1884 has brought back Charles Radbourn and both Welch and Keefe pitched in New York for pennant winners. Clarkson pitched for the Cubs and Kid Nichols gets a lot of votes as the best 19th Century pitcher. 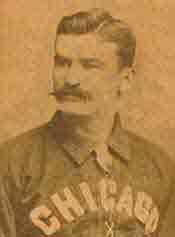 So if I had to pick a 300 win pitcher and call him the most obscure, it would be James “Pud” Galvin, the winningest pitcher of the 19th Century. Galvin was born Christmas day 1856 in St. Louis. In 1875 he began playing for the hometown Browns of the National Association (the only Major League at the time). He got into eight games as a pitcher, going 4-2, and played a handful of games in the outfield, hitting .130. The Association folded the next season and Galvin disappears from the Major Leagues until 1879. Between the two big league appearances he pitched for the International League team in Buffalo. In 1879, Buffalo joined the National League and Galvin stayed in the majors through 1892. Early on he picked up the nickname “The Little Steam Engine”, the first of a number of pitchers compared to trains. Walter Johnson (The Big Train), and Nolan Ryan (The Express) come immediately to mind. He played for Buffalo into the 1885 season when he was sent to the Pittsburgh Alleghenys in the American Association. In 1887, Pittsburgh moved to the National League and Galvin remained with them through 1889. 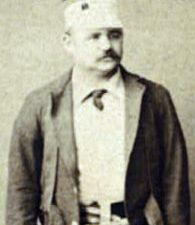 In 1890 he jumped to the fledgling Player’s League (joining the new team in Pittsburgh), then returned to the Alleghenys when the Player’s League collapsed. He went back to St. Louis (now the Cardinals) toward the end of 1892, then retired. At retirment he was the winningest pitcher in Major League history. He died in March 1902 in Pittsburgh. The Wikipedia article on him indicates that the nickname “Pud” was an abbreviation for “Pudding”, which is what his pitches turned hitters into. I’ve been unable to track down a better explanation. Galvin seems to be the first of the PED boys. Apparently he took an elixir that contained monkey testosterone to help him stay in shape and sharp. There are a lot of jokes to be made here about arm length and hair and such. I think I’ll simply mention the fact and let it go at that. Galvin pitched far enough back that many of his numbers are in dispute. I’ve taken the newest baseball encyclopedia numbers for use here and recognize that when the next version comes out they may be different. For his career Galvin had 361 wins, 308 losses (for a .540 winning percentage), with 5941 innings pitched. He gave up 6352 hits, walked 744 and struck out 1799. For all that he had a 2.87 ERA in 697 games, 681 of them starts. His teams never won a pennant or a postseason series. In his career best seasons of 1883 and 1884 he won 46 games each year, leading the league in innings pitched in 1883 with 656, and threw a league leading 12 shutouts in 1884. In 1883 he tied the all time record (with Will White) for the most games pitched and started in a season with 76 games and 75 starts. Galvin is very difficult to evaluate. For one thing, he never pitched a big league game at 60’6″. He’s one of only two 300 game winners to do that (Radbourn is the other). How he would have done at the modern distance is simply unknowable. Additionally, the ball and strike counts varied during his career. Sometimes there were four balls and three strikes, sometimes there were more. Throw in the differences in equipment and fields and you have a pitcher doing his job in conditions that are alien to us. Having said all that, there are still a few observations that can be made. He gave up more hits than innings pitched, which is never a good thing. His walks to strikeout rate is pretty good (2.4 strikeouts per walk) for the era without being great. He got a lot of wins (and losses) but pitched in an era when two pitchers was fairly normal and one single hurler could occasionally dominate a team’s statistics. Bill James in his Historical Baseball Abstract does not list him among his 100 greatest pitchers and the WAR statistic puts him 27th between Don Sutton and Curt Schilling (and two below his contemporary rival Radbourn). I see that Ralph Houk died Wednesday at age 90. He spent most of his career as a backup catcher behind Yogi Berra during the 1940s and 1950s. He got into all of 91 games over eight years, hit .272, had no home runs, and picked up a World Series ring in 1947, 1949-1953. He managed to get into two World Series games, one in 1947, the other in 1952. He pinch hit both times and made an out each. He was, in other words, a pretty mediocre ballplayer. He was, however, a heck of a manager. When Casey Stengel retired (forcibly) after 1960, Houk was his replacement with the Yankees. He promptly led the Yanks to World Series victories in 1961 and 1962, then won the pennant in 1963, losing the Series to Sandy Koufax and the Dodgers. He retired after that season, replaced as Yankees manager by Berra. He returned to New York in mid-1966, remaining through 1973. 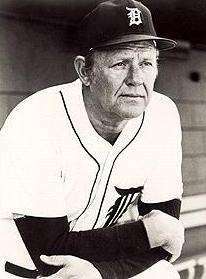 He managed Detroit from 1974 through 1978, finishing as high as fourth once. His managerial career ended in Boston with a stint in the dugout from 1981 through 1984. He finished as high as second in the latter half of the 1981 split season. His career managerial record gave him a .541 winning percentage. In 1986 he joined the Minnesota Twins front office. He helped put together the team that would win the 1987 World Series and provide the major parts for the 1991 World Series winner. Then he retired from baseball for good. Obviously his glory period was the 1961-63 era with New York. He managed the famous 1961 home run record race, helping Roger Maris to cope with the press, the crowds, and the nonsense. For all that he’s easily the least famous Yankees manager to win a World Series (OK, maybe Bucky Harris in 1947). I guess somebody has to be, but I always liked Houk. He was apparently a good clubhouse man and took care of his players. Following up Casey Stengel was hard enough, but winning on top of that was even harder. I rooted for him in 1962 and against him in 1963. Despite that, he was a man I admired. May he rest in peace. It’s really hard not to like Joe Mauer. He’s a heck of a hitter, he’s a darned fine catcher, and he seems to be a good teammate and a thoroughly likeable human being. He’s now won three American League batting titles. No other AL catcher ever won even a single batting title. The National League’s batting title has been owned by a catcher three times and, depending on how you look at it, one possible. Here’s a very brief look at the men who, other than Joe Mauer, have won batting titles while spending much of their time behind the plate. 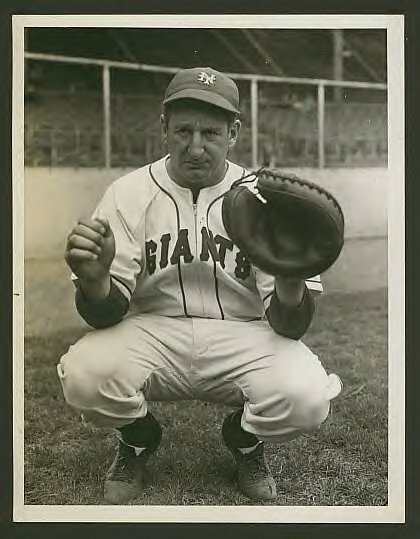 Ernie Lombardi won National League batting titles in 1938 with Cincinnati and again in 1942 with the New York Giants. Lombardi was a big, largely immobile catcher who could hit a ton and ran like a turtle. He’s sometimes regarded as the slowest man to ever play Major League baseball. A joke attributed to Dizzy Dean goes that Lombardi was so slow that he could turn a triple into a close play at first. Maybe, but he did have 27 triples during his career (mostly played in Crosley Field and the Polo Grounds, both of which had huge outfields). For his career he hit .306 with 190 home runs, a .460 slugging percentage, and 1792 hits over 1853 games. On the field he’s probably best known for being bowled over by Charlie Keller during the final game of the 1939 World Series. Unable to get up (the reason tends to change with the author who’s telling it), he let two more runs score before being able to regain his balance and senses. He took a lot of heat for the play, but the series was a Yankees sweep. He was part of the 1940 World Series champion Reds and made the Hall of Fame in 1986. There’s a nice fairly detailed biography of him in Bill James’ Historical Baseball Abstract. And before someone asks, as far as I know he is not related to the Green Bay Packers’ Vince Lombardi. Bubbles Hargrave was another Reds catcher who won the batting title, this time in 1926, breaking Rogers Hornsby’s string of six straight. For his career he hit .310 with 29 home runs, 786 hits, in 852 games. His batting title was controversial because he only had 326 at bats in 1926. He hit .353 and had only 115 hits in 105 games. Today he wouldn’t qualify for the batting title, but under the rules in play in 1926 he was the winner and I see no reason to dispute his title. 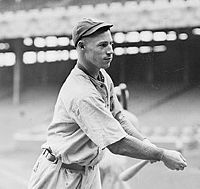 For the rest of his career his highest average was .333 in 1923 when he managed to lead the league in being hit by a pitch (12 times). He led the NL in fielding percentage one time and seems to have been a serviceable catcher. He died in 1969. All the way back in 1886 Mike “King ” Kelly led the NL in hitting at .388. He also led the league in runs that season with 155 and in slugging at .483. Kelly was a sometime catcher who played 56 games in the outfield in 1886, 53 behind the plate, and a handful in the infield. Beginning in 1888 he started catching more often than he played any other position. Prior to 1888 he spent more time in the outfield than behind the plate. Usually as a player ages he spends less time catching and more time in the outfield.. Kelly does it the other way. I’m not sure what that says about Kelly or about the catching position in 1880s baeball. For his career he hit .308 with 69 home runs, 1813 hits, a .438 slugging percentage in 1455 games. He also spent 750 games in the outfield and 583 catching, with 277 everywhere else (including 12 pitching performances). He made the Hall of Fame in 1945. He’s generally not considered a catcher when his batting title is discussed. I’ll let you decide what you think. So there they are, the catchers not named Joe Mauer who have won a batting title. Two of them (counting Kelly as a catcher if you desire) are Hall of Famers. That seems to bode well for Mauer. 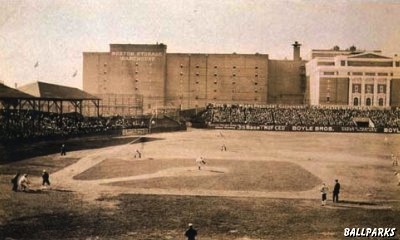 Today marks the 100th anniversary of one of those absolutely unique moments that baseball comes up with occasionally. 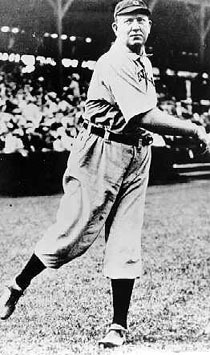 On 19 July 1910, Cy Young took the mound for the Cleveland Naps of the American League. When the day ended he had notched his 500th win, the only Major League pitcher to have 500 or more wins. The game on 19 July 1910 is interesting. Cleveland was on the road against Washington for a Tuesday double-header. They lost the first game 7-0, then Young took the mound for the second game against Senators hurler Doc Reisling (Wouldn’t it have been great if it were Walter Johnson?). Washington scored a run in the first, then in the ninth Cleveland scored two to take the lead. The Senators responded with another run to tie the score at the end of nine. Young held Washington scoreless through the tenth, then Cleveland picked up three runs in the eleventh. In the bottom of the eleventh, Young shut down the Senators and had his 500th win. He would, before he retired in 1911, add eleven more. Young holds a number of records and is part of a couple of fun little trivia bits. He’s most famous for the 511 wins, but he also leads the Major Leagues in losses, starts, complete games, and innings pitched. When he retired he was first in shutouts (he’s now fourth) and strikeouts (currently 19th). He threw the first pitch in World Series history and lost game one of the Series (he went on to win two other games in the Series). On 27 April 1893, he became the first Cleveland pitcher to throw from a mound when the pitching distance moved to 60’6″. He won the game, but his team was in Pittsburgh so he doesn’t get to be the first pitcher to throw from a mound. Between 1892 and 1896, inclusive, he averaged 32 wins per season. Between 1892 and 1904 he failed to win 20 games once (19 in 1900). For his 22 year career, he had four seasons (1905-06, and 1910-11, the latter two his final seasons) when he had a losing record (40-59 combined for the seasons). His career winning percentage was .618. And, of course, he has both a perfect game and a no-hitter. All this should remind you why the pitching award is named after Young. He is a truly great pitcher who seldom comes up when debates start over the greatest of all pitchers. Part of that has to be that he pitched a great deal of his career in the 19th Century. Another part is because of the current tendency to downgrade the “wins” statistic. He also pitches the first two seasons of his career at 50 feet without a mound. Take off the wins those two seasons and Young still has the most career wins. I’ve been a critic of the WAR stat when it comes to pitchers, but that stat lists Young as the top pitcher. I disagree, but he’s certainly someone who is in the mix. Bill James rates Young fourth in his Historical Baseball Abstract (Johnson, Grove, Alexander). Cleveland would fall short in 1910, and Young would have a poor season. He would get one more, equally poor. Then he would retire. In 1937 he would make the Hall of Fame. His plaque shows him with a Naps cap, the team for which he won his 500th game, 100 years ago today. In January of 1980, my family moved to the town where we currently live. I’ve raised a child here, I’ve seen the town grow and prosper, I’ve seen the town have deep financial trouble. I’ve also seen youth baseball have problems. It took a second to rehinge my dropped lower jaw before I asked “Can they hit?” It wasn’t the most brilliant or noble line I ever came up with, but in my defense, I was totally stunned. It was 1980 and all that sort of thing was supposed to be behind us (silly me). We were now supposed to be equal before both God and the law and I was being asked if I had a problem with having a black kid on my team. The question itself told me that a problem had occurred recently in the local league or that the guy talking to me was a first-rate bigot (I’ve known him for years and can assert he isn’t.). Anyway, I took the team, took the two black kids (one could hit, one couldn’t) and took on the season. We finished in the middle of the pack during the season and finished second in the postseason tournament. I coached again for several seasons, getting my son all the way through the youth baseball league, then gave it up. I don’t recall being asked a question like that again. I had teams that were integrated and teams that weren’t. We did well some years and awful others, but race did not become an issue on the team, nor did it seem to be an issue with other teams (but I won’t swear it wasn’t). My team parents had the same problems Little League parents always have: “Hey, Ump, you’d need glasses if you could see.” ” Hey, coach, how come that other kid is starting instead of my kid?” Hey… “. What I don’t remember is anyone questioning why the black kids were playing or asserting we’d be better (or worse) if we had more (or less) black players. This concludes my experiences with youth baseball and the issue of race. I think we’ve gotten a little better over the years since I first ran across the problem. If we can do that in sports, maybe we can do it in other aspects of our society. Well, I can at least hope. As a followup to my previous post, my new town was larger than the first, but had a smaller black population. I played four years of youth baseball there. We finished first twice, second once, and third the other time. There were a handful of black kids in the league, but not on my team. I don’t remember a lot of trouble between the black kids and the players on my team and certainly can’t speak to how that worked with other teams. I went into the US Army, spent an awful year in Viet Nam, then because I had some time left in the service, was sent to a small army post in Northern Virginia. There were enough kids to form one youth team and few adults willing to coach it. I managed to hook on as an assistant, handling the infield and coaching first base. The team had all of eleven players, most white, a couple were black, and one kid whose folks were of Filipino ancestry. We were good. Well, they were good, I just coached. The post team was traditionally part of the local town league and this season was no different. There were six teams in the local league and we rolled to the title easily (the only time I ever helped coach a team to first place). On the team itself there seemed to be no racial problems, at least none that I spotted. But that wasn’t true in the league itself. One of the teams was integrated, with ours having the most black players. I can’t speak to team unity on other teams, but I didn’t see any particular problems. What I saw was the parents. Now Little League parents are famous, or perhaps infamous. These had the same problems (as did some of our parents). But several of these had another problem. Coaching at first base, you are frequently the person closest to the parents of the other team so you hear things other members of your team wouldn’t. There were such classic lines as “Well, if we had that many black kids we’d be winning too.” By the way, “black” isn’t the word I most commonly heard, but this is a family site. “Well, what do you expect? Look at that black kid run.” There wasn’t a lot of obvious overt racism until you listened to the parents. Again, I left after that season and only heard that the post team did well the next year. Next I want to pass along an experience I had in my new hometown. That should conclude this topic. Just heard that George Steinbrenner, New York Yankees owner, died today at age 80. From this blog to his family, my he rest in peace. I am not a Yankees fan but I did appreciate Steinbrenner’s loyalty to his team, his constant striving to improve the level of play. Sometimes he made it worse instead of better, but we all do that on occasion. Here’s to giving him a fast track to Cooperstown. He was one of the most important and controversial owners in baseball history and deserves his spot on the wall beside some of his best players. As I’ve mentioned before, I grew up in a small town raised by grandparents. It was a time when social change was just beginning. The civil rights movement was in its infancy. Brown vs School Board was law of the land, Rosa Parks had decided she was tired, and of course Jackie Robinson was in Brooklyn, but most of the rest of it hadn’t occurred yet. In my little town I first ran across it in baseball. I played little league baseball (I don’t capitalize it because I don’t know if we were associated with Little League or not). Now no one was going to mistake me for Babe Ruth or Joe DiMaggio and certainly not for Jackie Robinson. I was a decent fielder and had been put in center field because I was fast and could catch. I didn’t have much of an arm and my batting was suspect, but I usually led off because I could tell a strike from a ball and almost never struck out. Of course the team was all-white. Then somebody decided it was time to integrate the schools and the summer league baseball teams. That came as a shock to the town. My grandparents weren’t sure how good an idea that was, but as there were only a handful of black families in town, they decided it probably wasn’t worth worrying about. So when baseball season came around I signed up again. We had different rules then. You played four years at the same level (instead of the two years that is common around here) and once you were put on a team you stayed there the entire four years. That was supposed to help you develop friends and learn from the same coach every year. (Of course that works better if you like the coach and your teammates.) So I knew where I was playing before the teams were set up. The rules required each player to be in the field one inning of of six inning games. Generally, the coach put one black kid in right field in the fifth inning and the other replaced him in the sixth. My job, according to coach, was to play toward right field so I could make the plays if necessary. That was a good idea, especially if the right fielder, black or white, had gotten as little training as the coach gave the two black kids. My reaction to all this was mixed. On the one hand I knew it was causing problems for the team. We had, after all lost a couple of players because of integration. On the other, I was, as I’ve mentioned before, a huge Jackie Robinson fan, so I didn’t mind playing with the two black guys. I thought they might make us better and I wanted to win bad enough I didn’t care what color they were. Not the noblest of reasons to support integration but at age nine you don’t think much beyond things like that. We finished about the same place in the league standings we did the previous year, third or fourth. I moved before the next season started so I don’t know what happened to either the team, the coach, or if the black kids played the next year or not. In another post I’ll keep this theme going. You are currently browsing the Verdun2's Blog blog archives for July, 2010.